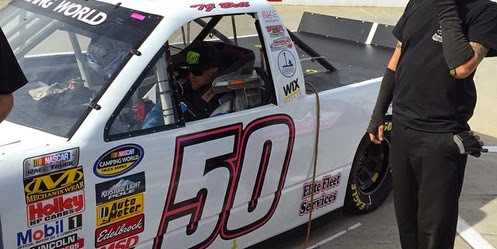 T.J. Bell picked up the 2nd last-place finish of his NASCAR Camping World Truck Series career in Saturday’s Kroger 200 at the Martinsville Speedway when his #50 Dedicated to Electrical Linemen Chevrolet fell out with a broken radiator after he completed 44 of the race’s 200 laps. The finish was Bell’s first of the season and his first in a Truck Series race since Michigan on August 18, 2012, 52 races ago. Following his most recent Sprint Cup start driving Frankie Stoddard’s #32 in late 2012, Bell and Mark Beaver’s MAKE Motorsports completed their 21st and final Nationwide race of the season with a last-place finish at Texas. In 2013, Bell and MAKE parted ways, and the driver ran eleven races for The Motorsports Group, coming up just short of a last-place finish while parking the team’s cars in seven of those starts. This year at Kansas, Bell and MAKE reunited with a 17th-place showing in the SFP 250, his best finish in the series since the 2007 finale at Homestead. Driving a #50 Chevrolet carrying logos in honor of electrical linemen - workers in the high-risk profession of servicing power lines - Bell and MAKE have made every race since except a withdrawal at Talladega, where Bell was slated to run a second MAKE entry, #56, while Milka Duno made her series debut in the renumbered #1. Bell’s best finish of the year remains a 15th at Dover, and after a 4th-place showing in his qualifier, he started 15th at Eldora and came home 21st. In most of these starts, Bell has driven a pre-2014-bodied Chevrolet, though he has on occasion run the updated template. The Martinsville entry list changed a few times through the week. Originally, the 37-truck entry list did not have a driver listed for the #35 Win-Tron entry that trailed the field at Las Vegas with Charles Lewandoski. By Thursday, when Peyton Sellers was selected to drive the Win-Tron entry, B.J. McLeod was replaced in the #08 by Enrique Contreras III. On Friday, a 38th entry was added with Dustin Hapka in his #93 Sure-Step Chevrolet. In qualifying, Hapka missed the show along with fellow independent Chuck Buchanan, Jr. in his #87 Spring Drug Ford. Hapka’s lone Truck start came at Iowa in July while Buchanan is still seeking his series debut. Bell ran 28th-fastest in both of Friday’s practices and backed up his performance with the 28th spot for Saturday’s race at an average speed of 93.107 mph. His truck was painted mostly white, carrying few of the bright blue and black graphics the team has carried for much of this season. In the race itself, however, Bell fell to the rear along with Wendell Chavous, who was making his series debut Mike Harmon’s #74 Vydox.com Chevrolet. Chavous had backed his truck into the fence during practice, but despite quick work by the crew, the truck was still off the pace. Bell also seemed to struggle early, running low on the straightaways to stay clear of traffic. Bell pulled behind the wall first while Chavous managed to come home 7 laps down in 27th. Early exits have been a rarity at Martinsville, and Saturday was no exception. No other driver retired until Lap 100, when Justin Jennings lost the brakes on his #63 Papa Murphy’s Pizza / Mittler Bros. Chevrolet. Finishing 34th was Jody Knowles, making his third start of the season and his first since Bristol in Tracy Wallace’s #80 Clayton Signs / Korban Partners Ford. Rounding out the Bottom Five were John Wes Towley and Brandon Jones, whose trucks were severely damaged in a grinding Turn 1 accident with 48 laps to go. Both drivers were uninjured. Finishing 8th on Saturday was 18-year-old Matt Tifft, whose series debut gave owner Christopher Long his first top-ten finish. Tifft threaded the needle in a mid-race accident and brought his #0 B.J. McLeod Motorsports Chevrolet home in one piece. Alex Guenette, who trailed the Truck Series field here in the spring, came home a career-best 9th in Turner Motorsports’ #32. And in his 20th series start, Caleb Holman picked up a career-best 11th in Charlie Henderson’s #75 Gain Flings / Food Country USA Chevrolet - the best run for Henderson’s team in any of NASCAR’s top divisions since August 23, 1992, when Butch Miller came home 11th in a Nationwide race at New Hampshire. With three races to go, the 2014 LASTCAR Truck Series title is still up for grabs. However, Justin Jennings picked up his 8th bottom-five finish of the season Saturday, matching fellow two-time last-placer Caleb Roark’s mark in the tiebreaker. If the season ended today, Jennings would take the title with 10 bottom-ten finishes to Roark’s 8. Charles Lewandoski runs third with 2 last-place runs and 7 bottom-fives, and is mathematically eligible to force a tiebreaker as well. Ryan Ellis and Mike Harmon, both with 4 and 2 bottom-fives, respectively, cannot rely on a tiebreaker and can only win the title by finishing last at least one more time. *This is the first last-place finish for the #50 in a Truck Series race since April 2, 2010, when G.R. Smith lost the engine on his MAKE Motorsports / Ronald McDonald House Dodge after 27 laps of the Nashville 200 at the Nashville Superspeedway. The number had never finished last in a Truck Series race prior to Saturday. That race was MAKE’s Truck Series debut and its only start running Dodges. *Bell is the first Truck Series driver to finish last because of radiator issues since April 17, 2004, when Ken Schrader’s #52 Federated Auto Parts Chevrolet fell out after 136 laps of the Kroger 250 at Martinsville.